Arial Shogren, a rising sophomore at Vassar College, holds up a piece of trash recovered from the Fonteynkill during a creek clean-up. Earlier this week I caught up with Arial Shogren. 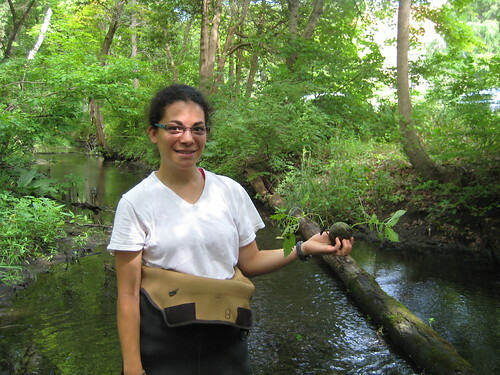 Arial has been working with biology professor Margaret Ronsheim this summer studying ecological succession in the Edith Roberts Ecological Laboratory that borders the Fonteynkill. We discussed the work that she has been doing this summer and the complications associated with managing the ecological laboratory. Given the take-over by non-native plants, I asked Arial if there were any future plans for the space. Are there going to be any efforts to bring back plant associations that are now missing or to control invasive plants? Arial told me that one of the big questions that ecologists and managers must grapple with when removing invasive species is what to plant to replace those species. In many cases managers will plant a different native plant species just to see it eaten by a non-native bug or taken over by another non-native plant species. Management is a constant struggle. Ultimately, it becomes an issue of coming up with a plan that preserves the space and respects its history while also working with the ways in which the space has changed.